This was originally a meme on LiveJournal that I found via a Pagan friend. She has a site here. The first deity I was ever aware of was Quetzalcoatl. I’m pretty sure He’s been around since my birth, but waited until He could show Himself to me, when I was ready. Though I think He was a bit disappointed when I had more of an interest in Egypt, He was still patient, and like a Father almost. The first time I heard the name “Quetzalcoatl” or “Kukulcan” that I can remember was when I was eight. There is an animated Star Trek series that I have always loved, even when I was four/five/six, I just don’t remember watching them in detail, other than that How Sharper Than A Serpents Tooth , with Quetzy, was my favourite. 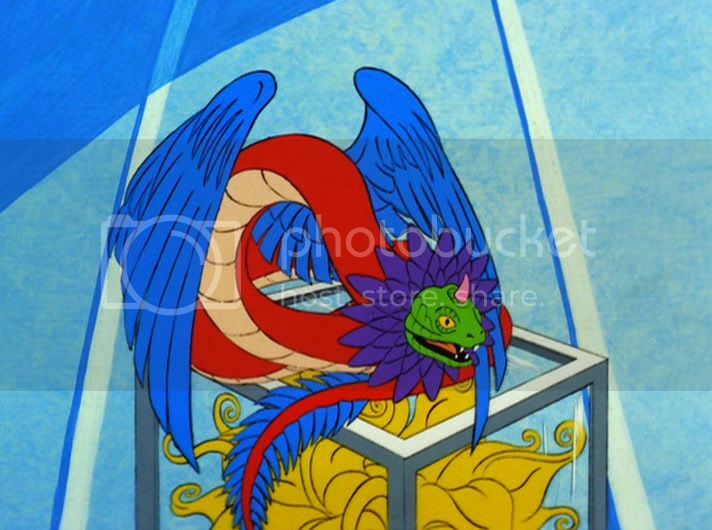 Fast forward nine years, and I had a dream where Quetzalcoatl came to me. I knew right away when I woke up that He wanted me to serve Him, and that He wanted to be my Patron God. Since that day (July 13, 2009), I’ve known that Quetzy is just a call away. He’s given me boatloads of confidence and comfort. It’s actually really funny, a few months after He came to me, Quetzy and I watched How Sharper Than A Serpent’s Tooth together. He was in his serpent form, but small (like, the size of a large garter snake), and curled up on my back to watch it. It was honestly one of the most amazing feelings ever. When He comes to me, Quetzy is always in the form of a winged serpent. If He doesn’t go sit (can snakes sit?) somewhere, like the couch, the coffee table, my shoulders, my head, He likes to fly. The next deity that connected to me is Thoth. He doesn’t come around as much as the Mesoamericans, but in a time of deep spiritual crisis, Thoth pretty much is there if you want Him to be. Though I don’t think He’s a Patron deity, He still is pretty close to me. He’s the first deity I ever really worked with. I have a second male Patron deity. Another Mesoamerican. He came to me when I was younger too, but I didn’t get the clue-by-four. I was seven, what do you expect? When I became a Pagan, and started researching and after Quetzy came to me, He decided it was high-time to try the cluebat once more. First, I re-read the books that He was in. Second, I found an artefact of Him in a Facebook game. Third, He was mentioned in a discovery channel show. Needless to say, I got the hint. The Deity? Cama Zotz, Mayan bat God of the underworld. He is the Darkness to Quetzalcoatl’s Lightness. They are a pair, really, and I affectionately refer to Them as my Father’s. Cama Zotz’s energy is much calmer than Quetzy’s especially during the day. He is more quiet and less excitable. I don’t mind, it sort of keeps the balance between the hyperness of Quetzalcoatl from totally making me nutty. 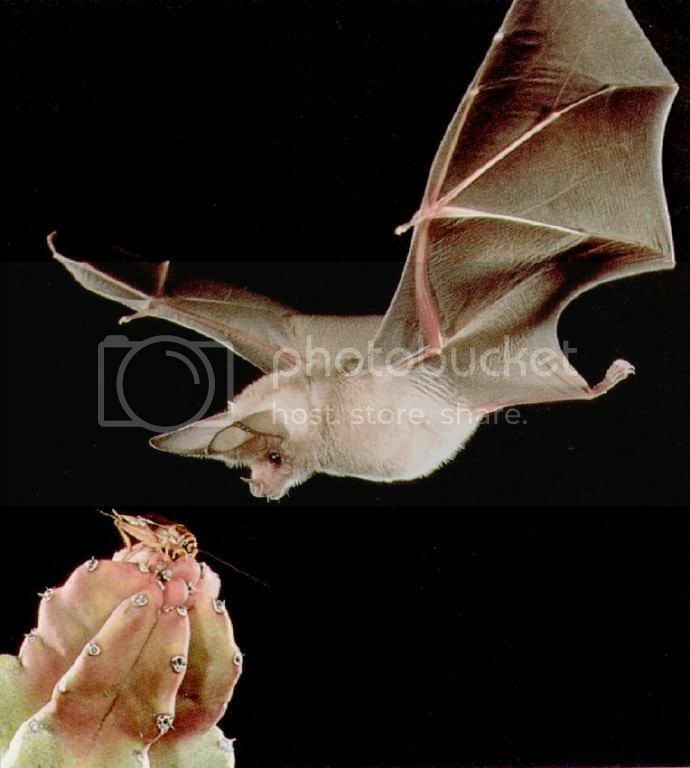 When He comes to me, I see a big leaf-nosed bat. Not like monster-sized, but with at least a four-foot wingspan (when I don’t come to Him for protection. When I do, He usually comes big enough to surround me with His wings. Bat cuddles are the best kind). He also sort of reminds me of Chernabog from the last bit of Fantasia. 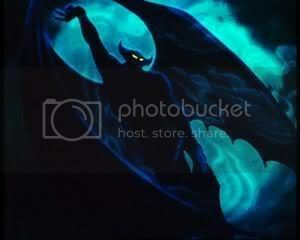 Not like evil with demons dancing around, but big and imposing and scary until you get to know Him. There is a distinct lack of women on this list, I admit. I don’t have a female “patron” deity, but I do have one (or three, depending on how you look at it) Goddess(es) that I have a connection to. For the longest time, I would mishear things, or just hear things in my head, that said “Shakti”. 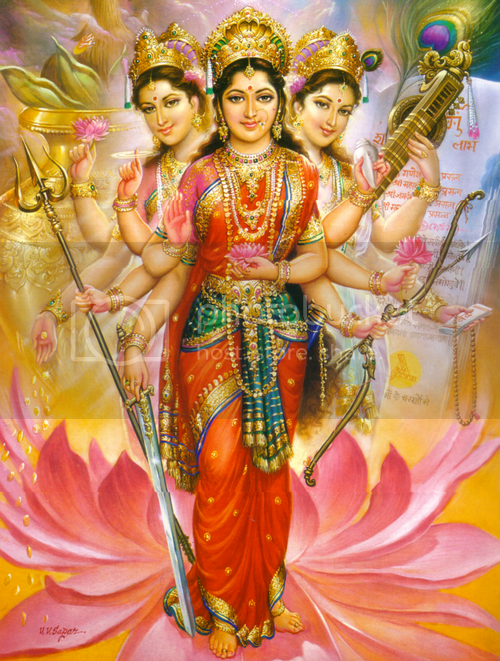 Shakti is a Hindu belief that combines the three chief Goddess: Laskshmi, Parvati, and Saraswati. This is also called the Tridevi. I received a message from the Tridevi on June 21st, 2010. In which, I was told that They are not patron deities, but they are instead here to provide balance. In spells or rituals where I need to call on a female, I can call on one or all of them. I was also told that they are Ladies of Dance, but I’m not sure what They mean by that. I work with a variety of other Deities from loads of cultures, but these are the ones I’m closest to at the moment.